We are so proud of the art we have created in Room 1617. We wrote letters to the Hastings Art Gallery and the artist that inspired our art work, Jacob Scott. 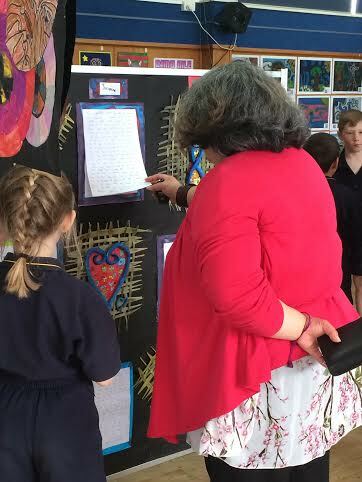 We were privileged to have these special people visit The Parkvale Art Exhibition with Room 1617 children explained how all our art tells a unique story of 'Us'. Mrs Ramsay and Mrs H were so proud of how the Room 1617 Superheroes explained their learning and how important their story was. We are holding an art exhibition at Parkvale School between Tuesday the 15 September and Friday the 18 September. 8am each morning it opens until 5pm at night it closes. We have been learning about Jacob Scott. All of his art tells a story and all his art made of metal. We are making art about ourselves. It is made out of clay, paint, paper and flax and all our relations on it. I liked the fish trap on display because it was made of shells and because what ever direction you looked at you always see something different. The fish trap told the story of how the Kiribati people catch their fish. Can you come pretty please with a hot chocolate with marshmallows on top. Hello my name is Katie. We are having a Art Exhibition on the 15 of September and it closes on the of 18th September.We are learning about weaving and Maori symbols. Our art tells a story too. We are learning to use clay and paint and harakeke to tell a story. Chris Charteris made the fish trap it looked like a sting ray made out of shells. I like it because it can keep fish fresh.It is special because it tells a story about how people feed themselves. Please come to our art Exhibition. We are going to have an art exhibition and we want to know if you can come. Our Art exhibition is on Tuesday the 15 of September to Friday the 18 of September . Our exhibition opens at 8am and concludes at 5pm. My favourite part at your exhibition is the spider by Chris Charteris because it looks impossible to make and how it tells the Kiribati legend of how Earth was made. Thank you for showing us around the gallery. We learnt about Jacob Scott and how his art tells a story .We told the story of us with our art. Our art has some of our own symbols and designs . Our shapes are made out of air dry clay .We Placed our art on harakeke (flax ) which we weaved .It is hard to weave especially when you have not practiced for a long time .Our WALT (We are learning to) was to have a unique composition in our art. We made our own designs and some Maori symbols. We really want you to come and see our art. On Tuesday 15 September to Friday 18 September we are going to have a art exhibition! It will be open 8am to 5pm daily. Its on Howard Street Hastings at Parkvale School in our hall. At the gallery my favourite piece of art was Te Ma the Fish Trap made by Chris Charteris because when the fish swim inside the trap the trap shuts right away. 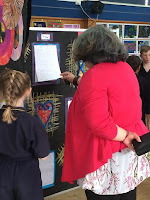 I loved going on the art trail trip and please come to the art exhibition at our school to see our art. Room 1617 have been learning about Jacob Scott’s work. We hope to see you at the art exhibition. We have been making some harakeke mats and some flax flowers and we are also making some Maori shapes to put onto our woven mats with unique pieces of art that tell my story. Parkvale School is planning an art exhibition at the school hall between Tuesday 15 September and Friday 18 September. It will be open from 8am each morning until 5pm at night. Chris Charteris art inspired me. My favourite piece of art was the fish net because the shape was exquisite. I remembered the fish trap was to catch fish. They would nibble, nibble, nibble right through the front of the centre of the huge fish net. Our class joined 3 pieces of art together to make a unique composition about ourselves. Our class got really untidy while we were weaving our background with real flax! We would be really, really, really, really happy if you could come to our art exhibition to see our wonderful art. fantastic effort with your artwork which produced a beautiful result!